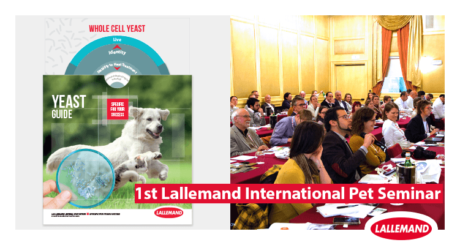 Lallemand held its first international seminar dedicated to pet nutrition in Verona, Italy, on April 4, 2019, which attracted around 60 professionals from the petfood industry from across Europe and North America. The event, focused on ‘Microbial solutions for pet well-being’ and offered a great combination of scientific insights on the key role of the gut microbiota from international experts in pet and human nutrition, with technical and regulatory information on the use of yeast-based ingredients to formulate innovative petfood solutions. Such an event, not only provided a platform for communication, but also broadened the horizons of practitioners, inspiring the innovative application of microbial solutions in the petfood business. Digestion, behavior, anxiety and immune defenses all have in common a link with the digestive microbiota! This is increasingly well understood and accepted for humans. At the seminar, international speakers such as Professor Vassilia Théodorou (INRA, France), Dr. Robert Falconer-Taylor (Center of Applied Pet ethology, Scotland), and Professor Giacomo Biagi (University of Bologna, Italy) demonstrated that it is also true for pets through a series of inspiring lectures. Presenting recent feeding trial results, Professor Biagi brought scientific evidence that the specific association of inactivated yeast, YANG, could help reinforce dogs’ natural defenses. Following these positive testimonials on the potential of yeast products for pet well-being, the rest of the session focused on the technical and nutritional aspects of yeast. Dr. Francesca Susca from Lallemand Animal Nutrition presented on the multiple benefits and applications of yeast and yeast derivative products for pet nutrition and introduced the new “yeast guide”, a decision-making tool to help nutritionists select the optimal yeast product for the right application. Dr. Davide Galaverna brought his regulatory expertise on how to label and claim these on packaging. The day wrapped up with a practical session conducted by Bruno Bertaud from Lallemand Animal Nutrition, and Greg Erdei from Lallemand BioIngredients, perfectly illustrating the fact that not all yeasts are the same. Contact us for a complete report of the event.